Mary’s Review: A very short read with bright colorful illustrations. It tells the story of a very big red dog mamed Clifford who is a big friend to his owner Emily Elizabeth. Clifford goes to Emily’s school to take her something she forgot and will need later in the day. Read this book and find out what it is. I recommend this book for ages 3-5. 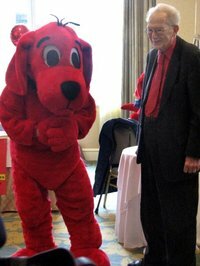 About the author: Norman Bridwell is an American author and cartoonist, best-known for the Clifford the Big Red Dog series of children’s books. Bridwell attended John Herron School of Art in Indianapolis, Indiana. He currently resides on Martha’s Vineyard, MA, where he continues to write an average of two books a year. Buy Clifford Goes To School now for 3.99. So cool that you reviewed this book. It was one of my favorites as a kid. I can’t wait to have a baby so I can share Clifford. The nice thing about these books is that they work for boys and girls. New follower!